Marlborough – The newest shop in the Vin Bin family is tucked into the short strip of stores between Hannaford’s Supermarket and The Long Horn Steak House in the RK Plaza in Marlborough. The understated but distinctive Vin Bin signage, the cozy crimson chair and ottoman flanking the entrance, the wood tones and antique table already set up with an array of reds awaiting a wine tasting, echo the aesthetic of the other Vin Bin shops. And, while Vin Bin West, like its sisters in Southborough, Hopkinton and Marlborough east, has a constantly changing inventory of quality wines, craft beers and artisanal cheeses, the new shop is a little different. There is something here for every taste and price point, a happy juxtaposition of an upscale wine, beer and cheese shop, and a typical liquor store. 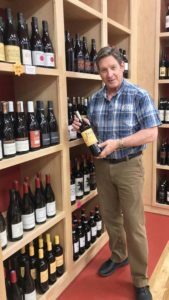 Wines, tasted and carefully hand selected from all over the world by owner Rick Lombardi and General Manager Aaron Aykanian, line the shelves along the right side of the shop. No matter whether from France, Spain, Chile, or California, Washington, or Oregon, “Rick and Aaron specialize in trying to find wines that are a good value, and not found everywhere,” Darren McLaughlin, the store’s manager, noted, adding that one of his personal favorites is a red blend, “Pendulum,” which hails from Washington state. Most of the wine at Vin Bin West sells for between $10.99 – $14.99 per bottle, he continued, but McLaughlin still sells the occasional “top shelf” bottle priced at around $100. Customers can also find familiar selections available in larger liter bottles, as well as boxed wine and even wine in cans. With several hotels nearby, a half-bottle wine option has proved popular with short-term guests. The multi-door cooler lining the left wall reveals another collaboration: a large collection of local craft beers, such as Jack’s Abby, Wachusett and Castle Island, fill the shelves, while national brands, like Coors, Budweiser and Pabst Blue Ribbon, sit shoulder to shoulder nearby. At the back of the shop, adjacent to the cooler, sits the Cheese Bin: an inviting counter offering a variety of high-quality artisanal, locally sourced cheeses, hand cut upon purchase to insure ultimate freshness. “We are a hybrid Vin Bin,” explained McLaughlin. McLaughlin, a long-time Marlborough resident, brings 32 years of experience as former General Manager for the Wayside Racquet and Swim Club, as well as many years of involvement with the Marlborough Regional Chamber of Commerce and the Marlborough community, to his role at Vin Bin West. He feels the staff has a strong commitment to customer service and pride in the quality products they sell. McLaughlin pointed out that the job is a learning experience: he and his staff research the wines and write up tasting notes. They work together and learn from each other. 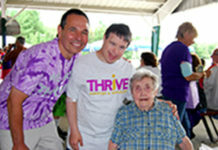 The retail nature of the business insures that he still maintains the community contact which he loves. The strategic location of Vin Bin West, across the street from the new Apex Center and close to so many of the hotels in the area, has always brought a steady stream of the city’s many business and recreational travelers through its doors, but McLaughlin feels that shop’s events have helped put Vin Bin West on the map for local residents as well. The shop features wine and beer tastings every Friday, starting at 5 p.m. On Saturdays through the end of April, Vin Bin West also offers cider tastings starting at noon. Vin Bin Academy classes, a series of educational presentations on wine and wine trends, will also be held at the Vin Bin West location. Their first class, on Italian wines, sold out a week prior to the presentation. The next class, “Traveling the Loire,” will be offered Tuesday, May 14, from 7-8 p.m. Those in attendance will have the opportunity on the night of the class to receive a 20 percent discount off the regular price of three or more wines featured in the class or in the store.